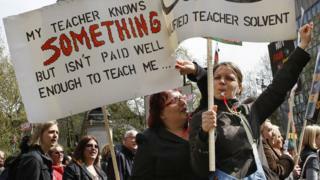 Time for teachers to get Budget pay rise? The last few working days before the Budget are a tricky time for any chancellor. It is the period when the final calculations are made about which of the myriad pleas for money from department colleagues are agreed. And which are going to be turned down - via uncomfortable settlement discussions with the affected minister. It is also the moment when Number 10's focus almost wholly swivels next door to Number 11. No chancellor who values his or her job can publish a Budget without the agreement of the prime minister. Although Gordon Brown did his best to blindside Tony Blair a few times. The Treasury and Number 10 are certainly getting on better now than they did before the last election, which makes the Budget process slightly less fraught. Those around the prime minister say she still harbours suspicions about the Treasury, following countless run-ins with George Osborne when he was chancellor and she was home secretary. But they also point out that James Marshall, the new director of policy at Number 10, is rather more relaxed about the performance of Philip Hammond than Mrs May's former chiefs of staff, Nick Timothy and Fiona Hill. The latest issue to land on Mr Hammond's groaning spending commitments in-tray is public sector pay. Under huge pressure following the Grenfell Fire, prison unrest and the terrorist attacks in London and Manchester, Mr Hammond agreed to proposals from the independent pay review bodies to loosen the 1% pay cap for police and prison officers. Teachers and nurses are now on the list - and today a powerful voice from the Conservative back benches added her weight to those who say that the cap, in force since 2013 following a three-year freeze, should be lifted. Nicky Morgan, the former education secretary and now chairwoman of the Treasury Select Committee, told me that although she did not back a "blanket" lifting of the limit, the case for teachers was a powerful one. "I think we will be talking a lot in the budget about productivity," she told me. "One of the ways to increase productivity is to make sure people are getting the best education, they're getting the best possible access to college and are being helped to be more confident about the skills they have for the jobs they are applying for. "So, inevitably, I would argue, yes, as a former education secretary, if I was still doing the job, I'd be having a pretty fierce argument with the Treasury about saying: 'Look, the public sector pay cap should be lifted, if not for everybody in the schools and education profession, then at least for those who actually we're finding it hardest to recruit and retain.'" When it comes to recruitment and retention, there is strong evidence on Ms Morgan's side. The latest report by the independent teacher's pay review body said "trends in teacher recruitment and retention data show that schools continue to face substantial pressures". And that "the number of qualified teachers leaving the profession for reasons other than retirement has continued to rise, and teacher retention rates have deteriorated". Mr Hammond could announce in the Budget that he is increasing education funding specifically to cover increased pay. He could also announce an increase for the Department for Health to cover pay, another area where there is considerable support for change. The pressure on health budgets, though, is not just a matter of remuneration for nurses. And this is the problem for the Treasury. As I reported last week, Number 11 wants this Budget to be dominated by housing. And by steps to increase productivity - the ability of the economy to produce wealth - by, for example, investing in transport and digital infrastructure. Just as with intergenerational fairness, on public sector pay, the Treasury may want to make some positive noises in the Budget. Whether they will actually be able to afford anything concrete is another matter.